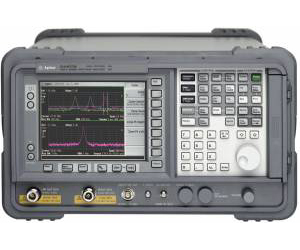 Agilent ESA-E Series spectrum analyzers with the noise figure measurement personality (Option 219) provides the flexibility of general-purpose spectrum analysis combined with built-in one button noise figure measurements. This solution automates the measurement process allowing all the required calculations for noise figure, gain and related metrics from 10 MHz to 26.5 GHz to be made at the touch of a button. The ESA-E Series is the first commercially available spectrum analyzer that works with Agilent´s SNS Series noise sources. These noise sources provide the advantage of electronic storage and automatic download of excess noise ratio (ENR) data to the ESA, speeding up overall setup time. With other features like DUT setup menus, context based help, and a built in uncertainty calculator, the ESA is the solution to help you comprehensively characterize your DUTs noise figure at a reasonable cost. An optional internal preamplifier (Option 1DS) and the instrument´s inherent performance characteristics combine to produce instrument noise figure uncertainty below 3 GHz as low as ±0.24 dB.